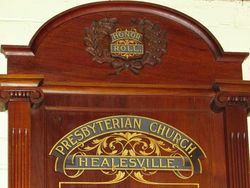 The Honour Roll is a wooden honour board which commemorates those connected with the church who served in World War One. 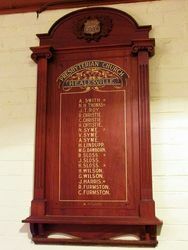 The Honour Roll, when originally unveiled, contained 14 names, with additional names being added at a later date. 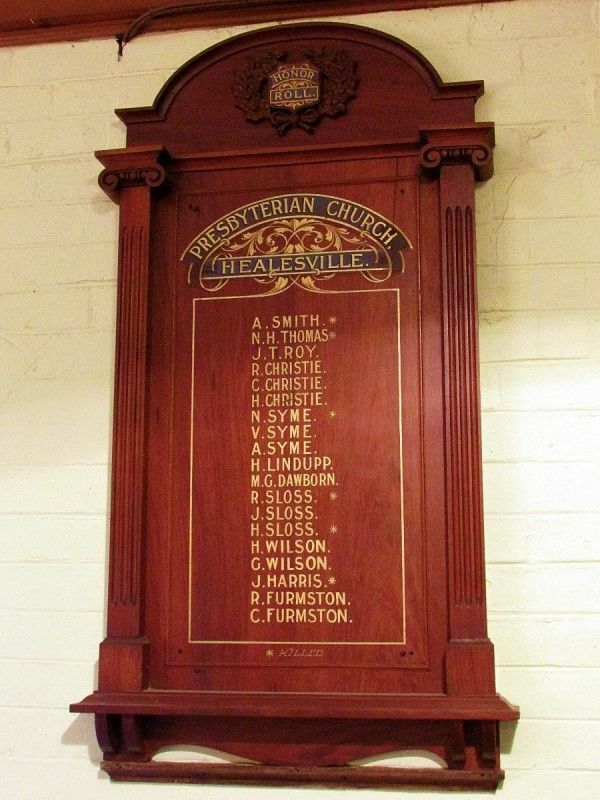 An Honor Board containing the names of fourteen members of the Presbyterian Church, Healesvile, who joined the colors and took part in the present war, was unveiled on Thursday evening last. The unveiling was performed by Chaplain Wilson M'Auley. About one hundred persons attended at the service, which was a very impressive one. Among the audience were relatives of many of the boys. The shire council was represented by the president and Crs. Parker, Blackburn, Varcoe, and Smith. The service opened with the singing of the National Anthem, after which Mr. Armour offered a short prayer. The hymn, "O God of Love, O King of Peace," was followed by the reading of portion of the 5th chapter of Galatians. "O God our Help in Ages Past" was sung with fervour and Mr. Hill (Methodist Missionary) offered prayer for the soldiers and for the nation. Healesville and Yarra Glen Guardian (Vic), 19 October 1918. Note: The Uniting Church was formerly the Scots' Presbyterian Church.